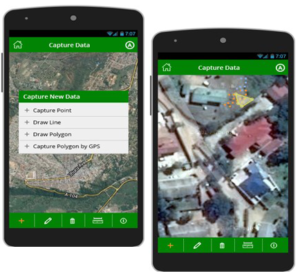 The mobile technology used by USAID in Tanzania features spatial visualization of parcels. Last week, we described how USAID uses participatory approaches to strengthen and secure land rights. This week, we highlight an innovative participatory approach to formalizing land rights using mobile phones. In Tanzania, USAID is piloting a promising participatory approach to document and record land rights information using low-cost mobile technology. We are training local community members to gather geospatial and land rights data, such as information about who has legitimate rights to land, parcel locations, and boundaries in rural and underserved areas. We are then working with officials, using our mobile technology, to deliver land titles based on this data. Using low-cost and readily available devices, such as GPS-enabled smart phones and tablets, coupled with participatory data collection methods, the project leverages local knowledge to build a reliable database of land information. This database can then be verified by the government so that formal documentation can be issued in a more transparent, cost-effective, and timely manner, to increase land tenure security for local individuals and communities. By using accessible mobile technologies to capture land information, USAID will improve understanding of household land assets at the village level. This information will improve land tenure security for community members, and will help communities and local officials improve the process of transferring and allocating land rights, leading to increased land tenure security. It should also help avoid conflicts related to overlapping or conflicting land claims. Check back next week to learn how participatory legal trainings were used to ensure women’s access to justice and land rights in Kenya.